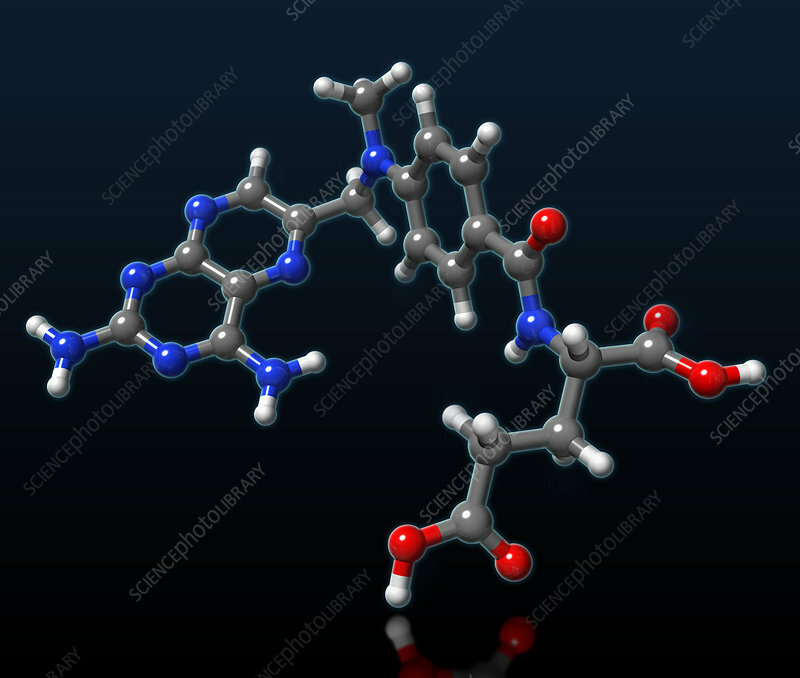 A molecular model of methotrexate, an antimetabolite drug used to treat cancer of the blood, bone, lungs, head, breast or neck, as well as rheumatoid arthritis and psoriasis. Methotrexate prevents enzymatic reactions from taking place during cell replication to interfere with the growth of cancerous cells. However this also affects the growth of normal body cells, resulting in side effects such as hair loss, damage to the lining of the mouth, stomach and intestine, decreased red blood cell count or liver damage. Atoms are coloured dark gray (carbon), light gray (hydrogen), red (oxygen) and blue (nitrogen).